JBC Tools JT-1QD is a high powered hot air station to repair all types of SDM quickly and safely, even the biggest QFPs and PLCCs. The JBC Tools JT-1QD hot air station features two work modes -manual or profile- to manage efficiently the temperature and the hot air flow. 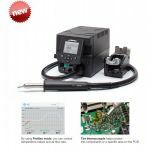 Using the JBC Tools JT-1QD hot air station menu you can personalize over 20 parameters to help manage the soldering process. Choose a JBC Tools JT-1QD Hot Air Station Today.